YOUR FIRST STEP TO IT ALL ---- The NAUI SCUBA DIVER Course! 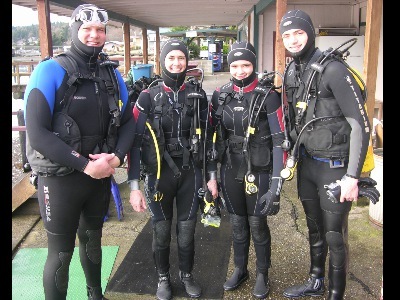 In this course, you will become familiar with dive gear and learn various underwater skills. 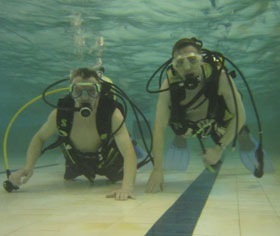 Skills include: mask clearing, mask removal and replace, regulator clearing, regulator ditch & recover, buddy breathing, safe second breathing, simulated emergency swimming ascent, neutral buoyancy, skin diving techniques, entry techniques, and more. You'll also learn about diving equipment, diving science, decompression, problem solving, dive planning and recording, the underwater environment, and about various diving activities! This course is six weeks in length, meeting one weeknight from 6 to 9 pm for lecture and one weekend night (usually Saturdays) from 6 to 9 pm for pool work. 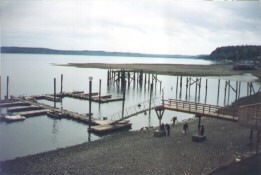 The final weekend is for your openwater checkout dives and is held in Hoodsport, Washington. 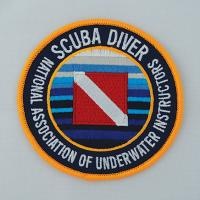 If you are certified but have not been diving in 2 or 3 years, a Refresher Course is highly recommended. 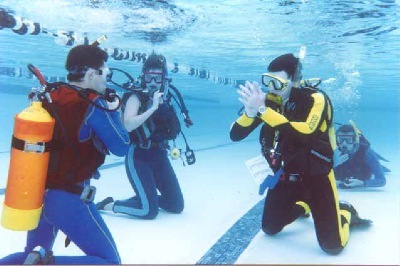 Fee for the Refresher Course is $100 less than the NAUI SCUBA DIVER Course, but you must go through the curriculum at the same time as a beginning class. 4. 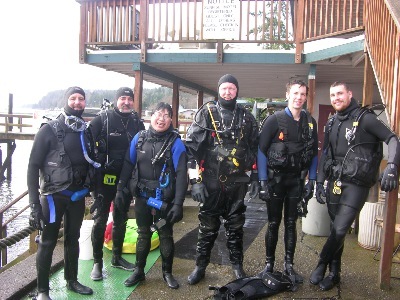 Neoprene boots, known as "booties"
One additional cost is $60 (per person) for the dorm fee at Sunrise Motel and Dive Resort in Hoodsport, Washington for the final weekend for the openwater checkout dives. 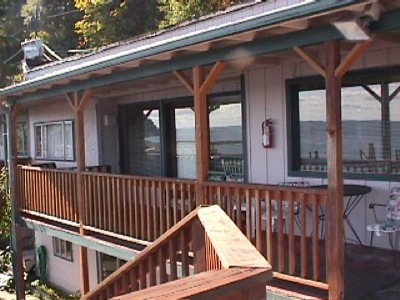 The fee includes accommodations for Friday and Saturday nights, plus three airfills for your tank. The dorm has showers, stove, fridge, microwave -- so you can cook in the room or there are also local restaurants within walking distance. You will do three dives on Saturday and two on Sunday. The second dive on Sunday is a skin-diving (surface) rescue exercise. The beach is right behind the resort, less than 50 feet from the facility. Checkout time from the facility is 1:00 pm on Sunday. There is a minimum of four students required for a class to commence, with a maximum of eight. Lee, Henry, Tommy, Karl (Instructor), Alex, and Matt (DMC). To secure your place in a class, a deposit of 50% of the course fee needs to be received no later than one week prior to the class start date, with the balance being due the first night of class. This needs to be remitted along with a completed Statement of Understanding. If under 18, a parent or guardian must complete and sign a portion of this form. SCUBA DIVER Class - March, 2010: Barry, Ann, Samantha, and Keil. Only when the deposit has been received with the completed form are you guaranteed a spot in the respective class. 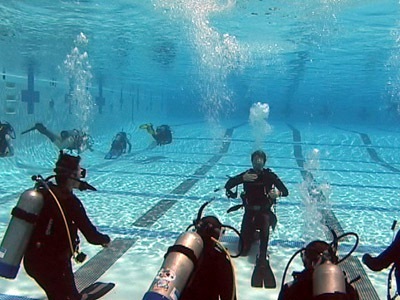 First dive class I taught in Oregon, way back in 1984! 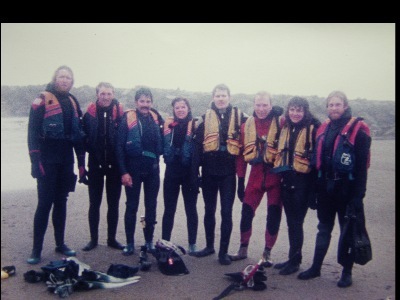 Left to right: Karl, Ken Clark, Tim Brown, Libby Sommers, Ken Perdew, Paul Welle, Margy (Vandecoevering) Jordan, and my divemaster, Kirk Halvorsen. To contact me, send me an e-mail to redpanda54@embarqmail.com or call (503) 377-2270.